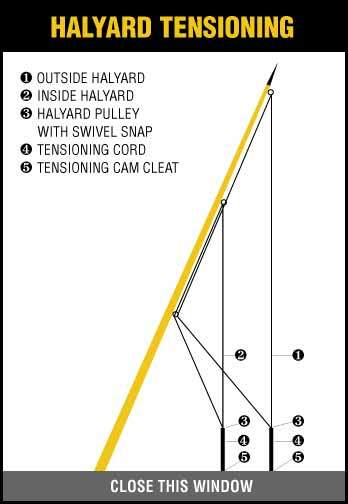 Malin Marine has developed the perfect Halyard Tensioning System, (HTS). HTS is designed for use with all types of outrigger and boat configurations. It is manufactured using the highest quality materials and is designed for simple installation and use. The system works by using a Cam Locking Device. Simply pull the tensioning ball to the desired tension and lock it. 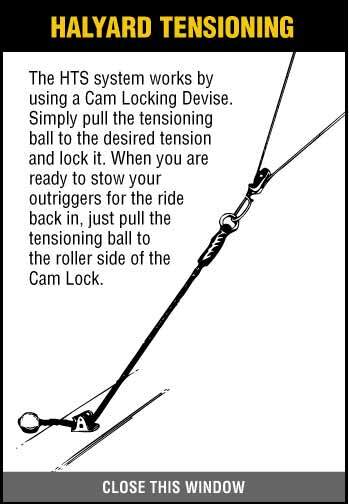 When you are ready to stow your outriggers for the ride back in, just pull the tensioning ball to the roller side of the Cam Lock. Most outrigger halyards loosen as the outriggers are placed in the fish position. If this is true for your application you would install HTS so it is tight against the tensioning ball while in the stow position. When the outriggers are in the fish position just tighten and lock into place. Malin Marine offers HTS in complete outrigger rigging kits or as individual components.